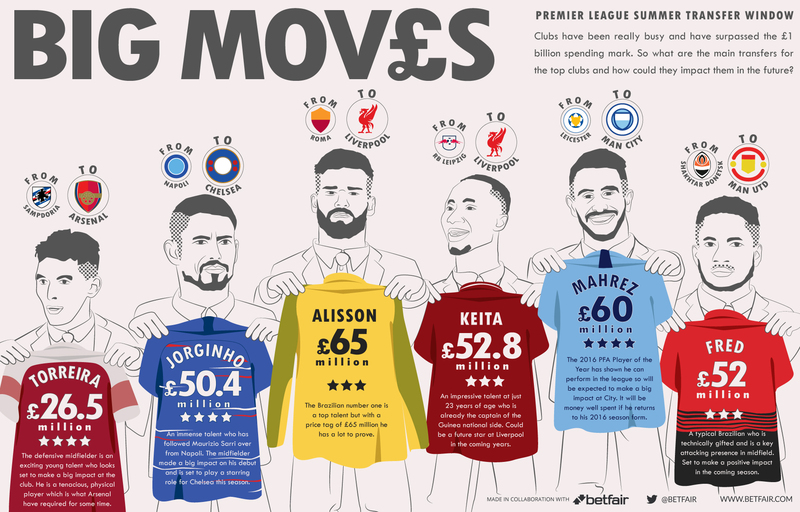 With the television deals continuing to bolster the spending of many Premier league sides it will come as no surprise that the league spending has long surpassed the £1 billion mark. Most of the top sides have been looking to invest in top talent as they not only push for Champions league football but for the Premier league title itself. It is certainly a time of transition for Arsenal as Unai Emery takes over the reins following the retirement of Wenger after 22 years in charge of the North London club. Emery has been busy looking to improve the squad ahead of an important season and one of those players he has brought in is Uruguayan Lucas Torreira. He impressed at the World Cup over the summer and looks just the player Arsenal have been missing for some time. He is a physical defensive midfielder and a very exciting young talent looking to the future. Arsenal will be hoping this change can result in them not only returning to Champions league football but again challenging for the title. So what about some of the other key transfers from the top sides in the league? Check out the infographic below which covers this. Many of the other sides in the league have also been busy in the transfer market as newly promoted Fulham and Cardiff for example will be pushing to stay up. The latest Premier league relegation odds make Cardiff 4/6 and Fulham 9/5 to head straight back down to the Championship. There is no doubt that excitement is continuing to build amongst fans ahead of the upcoming season. So yesterday marked the official confirmation of one of the worst kept secrets in transfer history, when Pierre-Emerick Aubameyang arrived at Arsenal to join ex-Dortmund midfielder Henrikh Mkhitaryan at the club. In terms of outgoings, we sadly saw Olivier Giroud move to Chelsea in a bittersweet move – he was “an Arsenal man” as Arsene put it and it’ll be strange to see him at Chelsea. I’m not convinced he’ll see more playing time their either than he did at Arsenal but we’ll wait and see. So once the dust has settled the fact is this. We’ve got Alexandre Lacazette who cost in excess of £50 million and brought in similar player in Aubameyang, for slightly more. So where is Arsene Wenger going to play them? Added to the fact we have Mesut Özil and Henrikh Mkhitaryan, we have an extremely lopsided team. And Arsene won’t change his philosophy and play 2 strikers will he? If those four players are in the starting lineup then that only leaves 2 midfield spots – one which will go to Granit Xhaka who needs at least a couple of players next to him to carry the defensive burden and he won’t get that as he’ll be next to one of Jack Wilshere or Aaron Ramsey. Has Arsene Wenger lost the plot? And added to this, where is our Plan B now? By getting rid of Olivier Giroud we have no Plan B, no alternative when Plan A doesn’t work. What are we supposed to do now if we can’t break a team down or we’re losing a match? We can’t bring on our super sub now can we? So it’s official, Alexis Sanchez has joined Manchester United while Henrikh Mkhitaryan has gone the other way in a straight swap deal. He joined in the summer of 2014 and was our second biggest “marquee signing” after Mesut Özil the season before. A lot of Arsenal fans will have negative feelings towards the Chilean forward but for me I can’t help but love him. Over the last few seasons, he is one of the very few players (perhaps the only one) who gave 110% every single time he put on the Arsenal shirt. He was a winner, someone who thought giving everything was the bare minimum and demanded the same from his teammates. And while his winning mentality was a hit with the fans, it didn’t go down so well with his fellow players. The problem was that Alexis Sanchez was at a team with serious deficiencies and while there were rumours of dressing room unrest, he just displayed how the fans felt. Like him, we were sick of the mediocre performances from certain other players and the fact that we would make the same defensive errors time and time again. While it’s never good to show the world your anger and distain for how things are on the football pitch, there must have been a point where Alexis Sanchez thought enough is enough and just snapped – hence the theatrics at Bayern Munich. Arsenal are a club where harmony is encouraged and while there’s nothing wrong with that, it encourages a lack of winning mentality or seriousness because no-one wants to rock the boat. But that’s the problem with Arsenal these days and why we’re stuck in a rut. Do you think Tony Adams, Patrick Vieira, Thierry Henry, Dennis Bergkamp and Sol Campbell would settle for the lack of effort and desire from the players? The problem wasn’t Alexis Sanchez, but the Arsenal team he joined. If he arrived at Arsenal 10 years earlier he would have fit right in – and probably won a hat full of trophies. “Gracias por todo Gunners ! I want to say thanks to the Technical Staff, to the medical team and all teammates with whom I shared many nice things for the club and especially those people who do not see themselves on the covers, but without them nothing would be possible, which are there to prepare food for us and take care of us day by day, those who keep our shoes clean and the grass in the best conditions. Many thanks to you for helping us to improve every day. Thank you very much ????. And can you blame him for leaving? Forget about the fact he turned down Manchester City (or they pulled out of the race) the fact is both Manchester sides have a much better chance of winning anything compared to Arsenal, whatever the massive wages he’s on. Robert Pires even said today that he thinks that Alexis Sanchez’s move to United wasn’t motivated by money but by the desire to win things. Jose Mourinho is a serial winner and won’t tolerate the kinds of mistakes we seem to make on a regular basis. For me, Alexis Sanchez was sensational for us and seeing him in a Manchester United shirt hurts more than seeing Robin van Persie in one. Van Persie was a sign of the times when we struggled financially, selling off players like Cesc Fabregas and Samir Nasri in those years, yet this one stings because we don’t have money problems. Financially, we can compete but players want more than that – players want to win trophies and sadly, it’s clear that isn’t happening at Arsenal. I wish him all the best, even though it will be so sad to see him in the red of Manchester.